This is an amazing, delicious one-pot meal. Jambalaya (jum-bah-lie-ah) is a southern United States dish that is a marriage of the Spanish and French culinary influences in Louisiana. 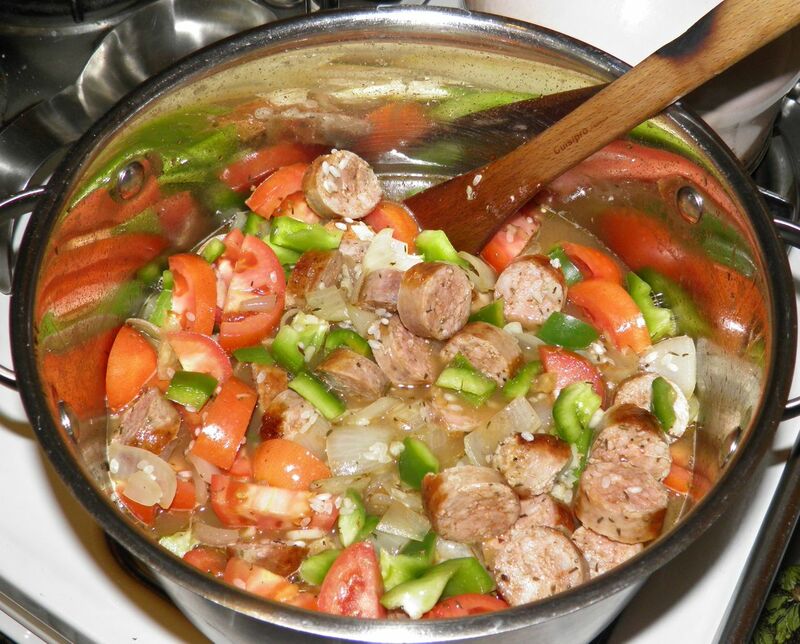 Jambalaya always has three main parts: meat (sausage and/or shrimp), vegetables and rice. As you can see by the ingredients it is very closely related to the Spanish dish paella. Four fresh andouille sausage, weighing nearly 1 lb. There are two different branches of jambalaya. The first and most common is Creole jambalaya, sometimes called red jambalaya, which contains tomatoes. This is the method used in my recipe. The second method is called Cajun jambalaya. It almost always contains no tomatoes. It relies on the browned “fond” from the bottom of the pan to create the colour of the broth in which the rice cooks. 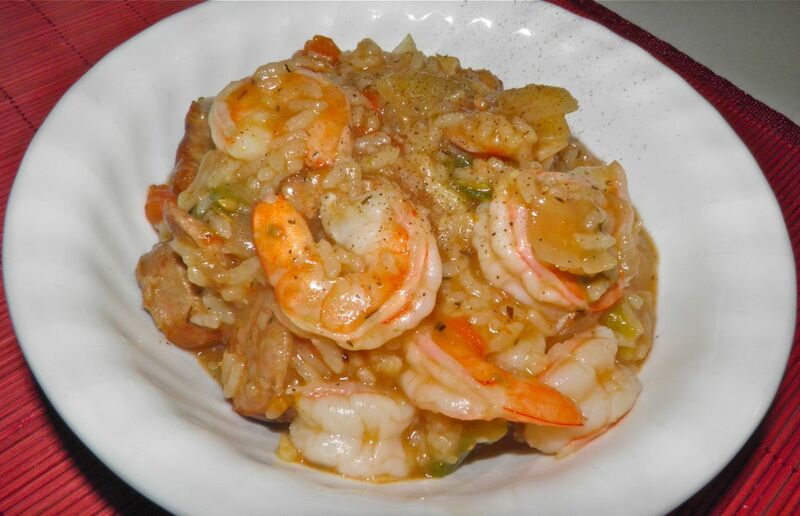 Jambalaya is different from gumbo and étouffée because in the latter two the rice is cooked separately and the main dish is served on top. In jambalaya the rice is cooked as part of the dish and the flavours permeate the rice as it cooks. 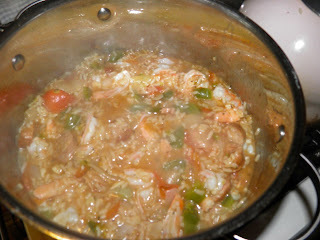 Creole jambalaya originates from the French Quarter of New Orleans. It was an attempt by the Spanish to make paella in the New World, where saffron was not readily available due to import costs. Tomatoes became the substitute for saffron. As time went on, French influence became strong in New Orleans, and spices from the Caribbean changed this New World paella into a unique dish. The first appearance in print of any variant of the word 'jambalaya' in any language occurred in Leis amours de Vanus; vo, Lou paysan oou théâtré, by Fortuné (Fortunat) Chailan, first published in Provençal in 1837. The earliest appearance of the word in print in English occurs in the May 1849 issue of the American Agriculturalist, page 161, where Solon Robinson refers to a recipe for 'Hopping Johnny (jambalaya)'. Jambalaya did not appear in a cookbook until 1878,when The Gulf City Cook Book, by the ladies of the St. Francis Street Methodist Church, was printed in South Mobile, Alabama. It contains a recipe for "JAM BOLAYA". Sauté the sausage in the oil in a Dutch oven or good sized stock pot. Cook until browned. 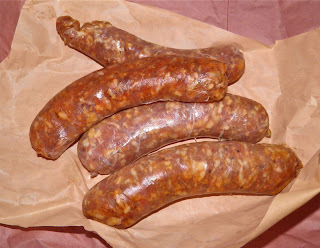 Remove the sausage and slice into 1/2 inch pieces. Add the onions to the pan and sauté for about 3 minutes. Then add the garlic and sauté for a further minute. Add the rice and stir to coat well. Cook for about 1 minute. This allows the starch to come out of the rice more slowly and evenly. This is just a minute after the shrimp were added. Add the green pepper, tomatoes and stock. Then add the ham, if using, and the spices. Stir well and add the sausage back in. Bring to a boil. Cover the pot, reduce the heat to simmer and let cook for 20 minutes. Check periodically and stir to ensure the mixture doesn’t stick and burn to the bottom of the pan. Add more stock or water if necessary. Most of the liquid will be absorbed after 20 minutes. Remove the lid and stir in the shrimp. Cook until the shrimp are just cooked through. This should take 5 minutes. Remove the bay leaf and serve with parsley sprinkled on top if desired.